Something about hardware stores causes us to change our behavior. Perhaps it’s the lack of high-design, or it's the intimidating rows of tools and miscellaneous doo-dads. Perhaps we’re annoyed because a project is keeping us from a relaxing, stress-free weekend. No matter what the reason, there’s no excuse for forgetting to practice good etiquette in the hardware store. Here are some of the biggest pet peeves of hardware store employees and behaviors to avoid if you want the best service. The most common source of consumer dissatisfaction is the paint department. People feel qualified to undertake the task of painting but underestimate how difficult it is to produce top notch results. Unhappy, they go back to the store with used paint supplies in-hand and an endless list of complaints. Here's how to avoid the blame-game: If you’re going to be a DIYer, properly research the painting project beforehand, in detail. It may not be the paint that’s defective but the painter! If you’ve never painted before, attend a free painting clinic offered at most big stores. Don’t be annoyed with painting associates when you’re dissatisfied with how color looks on your walls. Paint is made up of colored pigments that selectively absorb and reflect light. As lighting changes during the course of a day, so will the appearance of color in a room. Experiment in advance by hanging up larger-sized paint chips or painting a swatch on your walls. It’s difficult to predict if color is mixed correctly in the can because wet paint looks very different from dried paint chips. Occasionally, injectors dispensing pigment into latex base get clogged. Cut the paint department a little slack if they make a mistake or there is a glitch in the pigment machines. They’ll be happy to give you a replacement when the fault is theirs, but don’t expect returns on a custom match. It’s a rare color master who can tweak an unknown color recipe to perfection, and machines can’t always read an old paint sample, especially if it’s dirty. When it comes to custom colors, it’s your risk. Don’t expect associates or a store manager to know everything about every product. 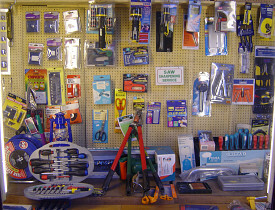 There are thousands of items even in small stores, and new products are developed every week. You wouldn’t walk into a library and expect a librarian to give you a detailed synopsis of every book on the shelves. If someone can’t give you advice don’t assume the worst – they may only be unfamiliar with the product or acting as substitute in a department that’s short-handed that day. Politely ask for someone with specific knowledge. Retailers assume you know what you want, won’t test your level of expertise and can’t see job site conditions. If you are a DIY-er you can ask for basic advice, but if you’ve hired a contractor, it’s not their job to comment on contractor’s plans. There are plenty of bad contractors out there – don’t blame the store for product failure due to poor workmanship. Remember, they do business with everybody and can’t act as your project manager. Hardware store employees have a love/hate relationship with home improvement television. While they entertain and encourage business, customers take them at face value and develop unrealistic expectations. Keep in mind shows are filmed over several days, and hours of work are condensed into minutes. Stores are responsible for defective products, but if a product fails from improper installation or use, don’t expect to be reimbursed. Follow manufacturer’s guidelines. If something goes wrong, a store may help you find a fix, but not if you have an adversarial manner because your project didn’t turn out like your favorite show. Need lumber cut? Larger stores have industrial saws to make custom cuts as long as you purchased the material from them and provide exact measurements. They’ll do this free, but don’t expect them to behave as your own personal lumber mill. Maintenance fees are costly for commercial machines. Expect to pay a per-board fee after a certain number of cuts, no matter how much wood you buy. If you haven’t thought out and implemented a game plan properly – again, that’s not their fault. If you purchased the wrong part or bought extra materials you didn’t end up using, they’ll accommodate you. If you aren’t sure what’s returnable, ask before you make a purchase so you’ll know what’s considered final sale and non-returnable. Save receipts in a safe place. Otherwise, expect store credit for an item returned without a receipt. They’re not trying to make your life difficult, but likely have experienced people returning items not part of their original inventory. Having a return policy in place benefits you in the long run, as it protects store profits so they won’t have to pass losses to consumers down the line. Above all, remember the basics — say "please" and "thank you." Everyone appreciates a smile and a great attitude! Laura Foster-Bobroff is a Networx writer. Read more articles like this one or get help with your home projects on Networx.com. What Are Dormers and When Should I Repair Them?